All you need to know about levelling & evolving Pokémon! In order to train and evolve your Pokémon, you must set it as your buddy. To do so, simply go to your profile, click the Pokémon Collection tab and then click the Pokémon you want to work on. 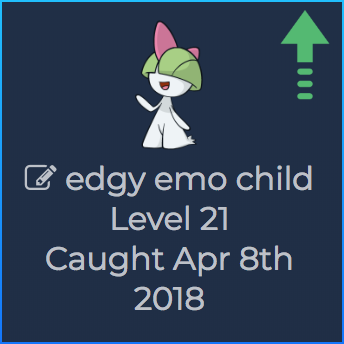 To level a Pokémon up, you'll need to post around the site. To post, enter one of our sections on the sites home page and find discussions you're interested in, then add a meaningful reply. Posting spam will be deleted, hence affecting how you level your Pokémon up. The best way to level a Pokémon is to get involved in our discussions and have a good time whilst you're doing it. Pokémon automatically level up as you hit certain posting milestones, so those levels will fly by! To see your progress, either click your username to get a popup (your Pokémon's info will appear) or hover over the PokéBall icon at the top right of every page. This will display how many posts your Pokémon of choice needs to level up, and how close it is to the next level. Different Pokémon will require different amounts of posts. As a Pokémon evolves, it will become harder to level up. Once your Pokémon has hit a certain level, it can evolve. To evolve your Pokémon, you must go back to the Pokémon Collection tab on your profile, then select the green arrow above your Pokémon if it is ready to evolve. Check out our ValorDex to learn when Pokémon can evolve! If the ValorDex doesn't have the evolution level, please report it yourself! If you've got an egg, it might take a bit longer to "evolve" as you will need to hatch it first. 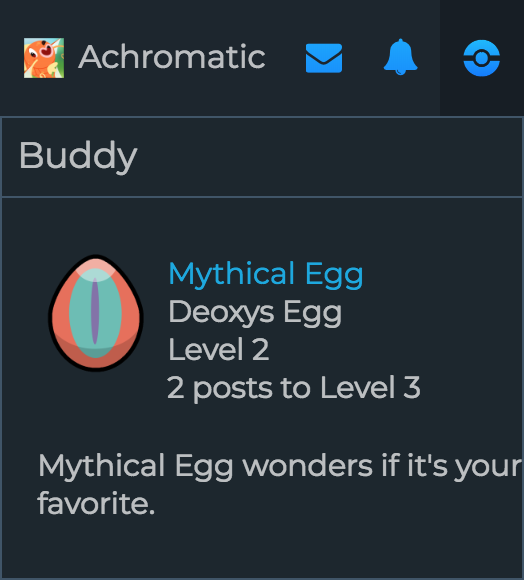 It won't hatch automatically, so you'll need to "evolve" it via your profile just like any other Pokémon to find out what's inside! Posting in the Game Corner section will NOT level your Pokémon up. As this section does not add to your post count due to the nature of it being very fast paced and even spammy, your Pokémon won't level up if you post there. Any other section is fair game though, so work on evolving those Pokémon and hatching those eggs! Can you hit level 100?